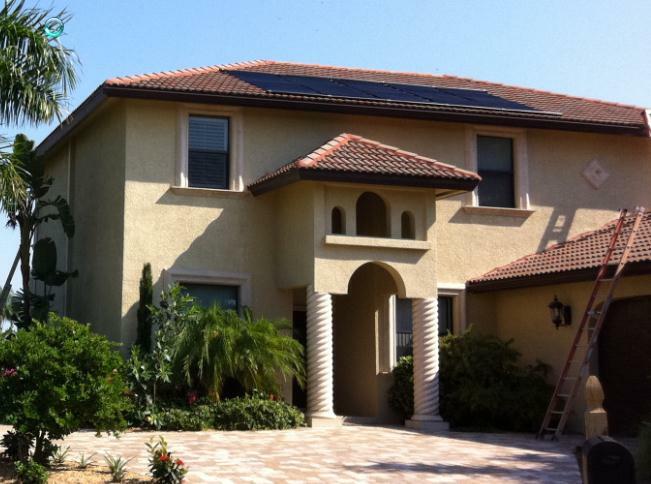 Can solar pool heating panels be put on a two-story home? Of course! However, there are some considerations that we need to look at. The first consideration is whether the existing pump is sufficiently powerful to lift water all the way up to the roof and keep an adequate flow rate to circulate and filter your pool. In most cases the answer is yes, but sometimes if you have a very small pool, a 3/4 horsepower pump may not provide sufficient flow. In this case, you best bet is to replace the pump with a variable speed pump that can operate at slow speed most of the time and ramp up its speed when solar pool heating is required. This can be done with an automatic controller to automate the process. Secondly, two story homes sometimes have multiple roof heights. It is important that we can run plumbing to the panels in a way that the panels can drain automatically and completely. This protects the panels from damage due to freezing conditions, which is rare in Southwest Florida. If the panels are to be installed on the lower roof level of a multi-level home, we need to consider shading from the higher building sections. Finally, it is obviously a bit harder to install panels on a second story roof. There may be a small extra charge. The installation may take two days in some cases, but there isn’t much extra material required. A mechanized hoist may need to be used, which required adequate access to the site. Generally these issues can be worked out with little difficulty. Yes, solar pool heating panels can be installed on your two story house. With proper planning and design, they will work as efficiently at heating your pool as on any other home. Once we start talking about 3, 4, or more stories, the design considerations become more involved, but it can still be done.